Carbon Brush Supply has been manufacturing carbon brushes for electric motors since 1979. Our staff has years of experience to help you get the proper brush grade for your particular application and environment. We sell and clean carbon brush holders and carbon brush springs using our vibra cleaning machine. We have over 1000 different types of carbon brushes in stock with the quantities varying from 2 to 250 for each item. 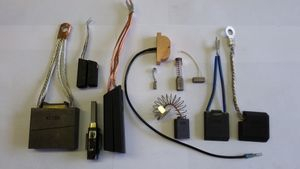 We have over 60 different grades of materials in stock for different applications and various voltages to build your carbon brushes. We have carbon rod in stock and manufacturer pump vanes. If brushes are not in stock, they can be manufactured to customer specifications and shipped within one or two business days for small orders. Large orders that have to be manufactured, can be processed and a shipping date will be provided within one business day. We are committed to getting your electric motor, generator, welding machine, or whatever piece of equipment you have, operating as soon as possible.